Home Sports Baseball Can the Reds Actually Make the Playoffs? Can the Reds Actually Make the Playoffs? As Cincinnati welcomed the New York Yankees into town on Monday, the Reds sported a record of 17-14 and stood all alone in first place in the National League’s Central division. Yes, you read that correctly: the Reds/Yankees series is a battle of first-place clubs, titans of their respective leagues. Okay, let’s not get ahead of ourselves. (The Reds did lose 10-4 to the Yanks last night, after all.) But the fact that they were atop the division a week into May is, if nothing else, evidence that the club is operating in an entirely different neighborhood than they were last year. No one is printing World Series tickets just yet, but suddenly this doesn’t look like a team mired in the bitter, endless depths of a rebuild/reboot/remodel/whatever. Let’s compare this year’s Reds to last year’s version. As noted above, the Reds had 17 wins as they entered play on May 8. Last year’s Reds team had 17 wins on June 1. Think about that: the Reds already have as many wins right now as they had after two full months of the 2016 season. Or think about it this way: on June 1, the 2016 Reds were 17-35. This year’s team would have to lose their next 21 games in order to have the same record as last year’s dumpster fire of a club after two months. I don’t think it’s being overly optimistic to suggest that the Reds aren’t going to lose every game for the rest of May. Let’s dig a little deeper. At this point one year ago, the Reds were 13-18. Cincinnati was in fourth place and, astoundingly, they were already 11 games out of first place. When they lost on May 8, 2016, they dropped into last place all by themselves, 12 games behind first-place Chicago. At the end of two months, the Reds were still in last place—a spot they would only briefly escape later in the season—19 games out of first. I know everyone is a little hesitant to believe in this version of the Reds, and I get that. But it’s not like this team is winning games with smoke and mirrors. They have one of the top offenses in baseball, ranking third in the league in runs scored (163) and wOBA (.342). They’re sixth in wRC+ (106). 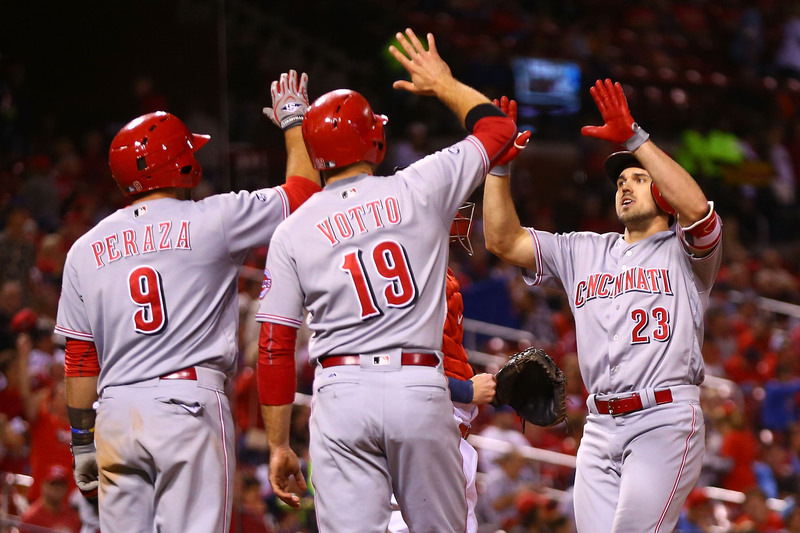 When the season began, no one expected the Reds to compete for a playoff spot. After 31 games of 2017, should our expectations be changing? Did you see that? By the CBS projection model, the Reds would finish the season with a record of 82-80. You don’t have to be a math whiz to know that would mean a winning record for Cincinnati, and it has been about a million years (or maybe it’s just four?) since the Reds won more games than they lost. Even more interesting, CBS gives the Reds an 8.8% chance to win the division, and 30.1% shot to make the postseason. A 30.1% shot? I’ll take it! Other sites use their own mathematical models to predict playoff odds on an ongoing basis. Baseball Prospectus places the Reds chances to make the postseason at 13.4%. FiveThirtyEight—in some ways, the gold standard for such modeling (unless you’re Hillary Clinton)—has the Reds at 18% right now. Take a look at FanGraphs “CoolStandings” odds. 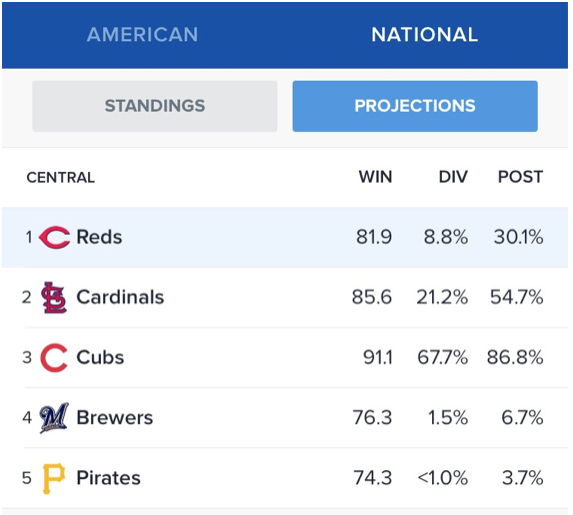 If you look at the NL Central’s playoff odds using their “Season to Date Stats Mode”—“This mode uses current season stats, weighted more heavily towards the most recent games, to calculate the winning percentage of each remaining game in the major league season.”—you see something startling. All of a sudden, I really like math (to the eternal surprise of Ms. Meade, my high school geometry teacher). Using that particular model, the Reds have a 21% chance of winning the division; they have a 37.9% chance of making the playoffs in any capacity. Those aren’t terrible odds, especially for a team that is just now trying to emerge from rebuilding mode. Then again, never tell me the odds. Are the Reds going to make the playoffs? No, probably not. They’ve been a fun team to watch for most of this season, and I expect that they’ll be fun to watch all season long. But a lot of things would have to go right in order for the Reds to stay in the playoff race over the next 130 games. First, the Cincinnati offense would have to continue murdering baseballs. Plus, the starting rotation has to get fixed in a hurry; guys like Homer Bailey and Anthony DeSclafani and Brandon Finnegan have to get healthy, and the Cody Reeds and Robert Stephensons of the world need to begin showing us what all the hype was about. Perhaps just as important, however, it would really help if the rest of the National League continued to be mediocre. Thus far, only the Washington Nationals look like world-beaters. The Cubs will likely start winning and winning big very soon. But if teams like the Cardinals and the Mets and the Dodgers don’t catch fire, who knows? Maybe the Reds can make some noise and stay in the Wild Card hunt for a few months. Don’t get your hopes up. Despite the numbers above, Cincinnati’s odds of making the playoffs are slim. But I’m telling you there’s a chance. And that’s the difference between this team, and the Cincinnati Reds of 2016 and 2015 and 2014. This year’s team has a shot—probably a slim one, but there is hope nonetheless—of being something. And even if the club can’t shock the world, it isn’t difficult to see how the Redlegs could be in the thick of the playoff conversation in 2018 and beyond. As it turns out, there is light at the end of this long, dark rebuilding tunnel. And it might be closer than anyone suspected. Chad Dotson is a contributor to Nuxhall Way, ESPN’s SweetSpot blog, and the founder of Redleg Nation. You can follow him on Twitter at @dotsonc.